The public transportation system in Mexico City is cheap and fairly efficient, but the size and intricacy of the system can be confusing, and buses and metro cars can get very crowded. If you'll be traveling on public transportation, it's best to dress comfortably and modestly and don't carry valuables with you if you can possibly avoid it. The metro is the easiest option for visitors to the city since you can purchase a single ticket at the ticket booth and consult the maps of the metro system that are on display at every station. All visitors to Mexico City should at least ride the metro once to see how millions of people get around every day, although for sightseeing purposes taking the Turibus may be a more convenient option. The metro runs every day. From Monday to Friday its hours are 5 am to midnight, on Saturdays 6 am to midnight and on Sundays and holidays from 7 am to midnight. The cost is 5 pesos for a one-way fare, but the elderly, people who are physically impaired, and children under the age of 5 accompanied by an adult ride for free. Locate your destination on the map and the station from which you're departing. Notice the color of the metro lines you'll need to take and the final station on the line in the direction you're going. At the station, you'll look for the name of the final station on the line to make sure you're taking the train in the correct direction. Purchase as many tickets as you think you will need because sometimes there are long lines at the ticket booth. Insert your ticket into the slot on the turnstile, and go through. When you have to change trains, you may have to walk through tunnels and up and down stairs so be prepared to walk a fair amount. There are occasionally vendors or beggars in the metro cars—this is just part of the scene. 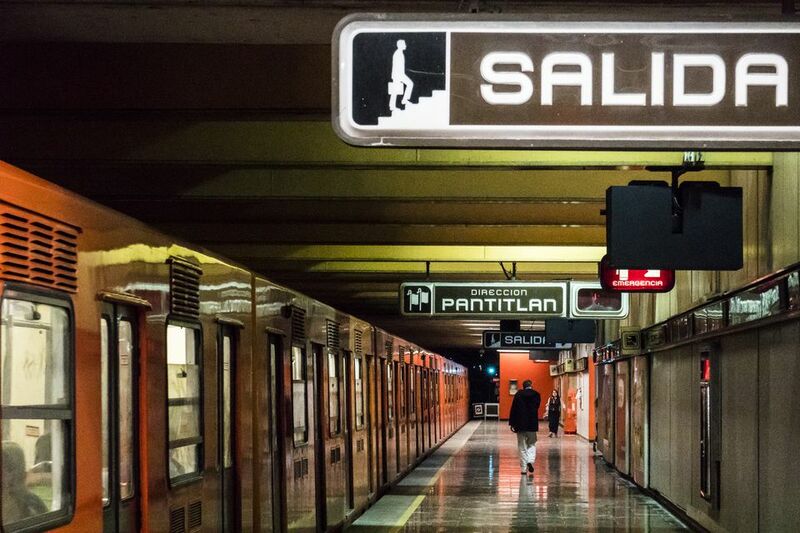 Taking the metro in Mexico City is relatively safe, but you should always be very conscious of your whereabouts and belongings. Because the metro can get extremely crowded during rush hours, it's best to keep any bags you may be carrying close to your body and make your way to the doors before your stop. On some lines at certain times of day (usually 5 to 9 pm, Monday to Friday) there are cars which are reserved for women and children - it's generally the first couple of cars at the front of the train. Women traveling solo should definitely take advantage of this option when available. The women and children cars tend to be much less crowded than the other metro cars, and are more comfortable.